Everyone hopes to find their niche in life, where they belong and how. For creatives, artists, musicians, this is even more the case. The journey is only complete when you can show your work to an audience that appreciates it… even if the next trip is to somewhere completely different. It’s less than a week after the pointless actions of hatred in Paris. You can see people taking a little more care, watching a little more closely. The South Bank is still overrun by people, even thought it’s only a Tuesday evening. Life continues, the music carries on. For the people walking to their destinations, for the people inside the Royal Festival Hall waiting for the music of Melody Gardot to begin. The auditorium is full, and it would seem Miss Gardot has indeed found her niche. It’s a strange thing to see, not for the music, but the blend of her act. It’s a mix somewhere between a Las Vegas show, an advice column in a glossy fashion magazine, and a conversation between friends (or even a Tarot reading, as someone near me commented). There is a serious light show going, surprising on my part as I know Melody Gardot suffers pretty bad headaches, and strong light are unlikely to help. But I also guess the sunglasses throughout most of the show are a solution to this problem. Still, the audience are focused and engaged fully from start to finish. It begins somewhat wobbly. The music is strong, but the swing just isn’t there. Again, this may be very much down to the timing of everything. They played in Paris that night, a place Melody Gardot has as a second home, and from her conversation and interaction with the French members of the audience, you can see and hear the sadness. However, as time passes, the swing comes back, and back with a solid kick in the sparkly bits! One thing that is beyond any question, Melody Gardot has a voice beyond compare, and one of a generation. It is a thing of wonder to hear such a solid range in voice, filled with passion and love for what it’s sharing with the world. 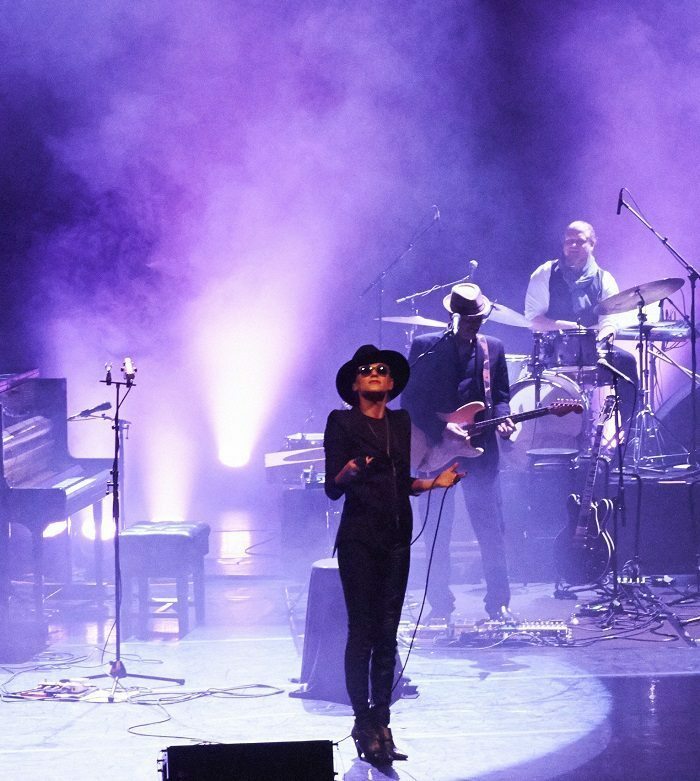 OK, it was a bit Vegas, a little talk show even, but the stage was owned by Ms Gardot, and the audience were taken on a trip with her, happily journeying through the world as she sees it. As she stated near the end, it really is all about love, and that’s what music should be for us all. So for the sake of love, let the music play on.